To find out optimum nitrogen (N) and micronutrients (MNs) doses for the growth and yield of sesame the experiment was undertaken at Sher-e-Bangla Agricultural University Research field, Dhaka, during April to July 2013 with three replications in a randomized complete block design (RCBD). Three different N levels viz. 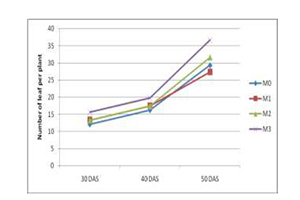 N0= without N, N1= 60 kg h-1, N2=120 kg h-1 and four micronutrients (MNs) levels viz. M0= without MNs, M1= 50 ppm MNs, M2= 100 ppm and M3= 150 ppm MNs. The N significantly increased morphological characters - plant height, number of leaves plant-1, branch number plant-1, fresh and dry weight of shoot and root; yield contributing characters- number of pod plant-1, pod diameter, pod length, seed weight plant-1, seed weight plot-1 compared to control (N0). The rate of application of N 60 kg ha-1 produced the highest seed yield (1.21 t ha-1) which is consisting with most of the vegetative growth of sesame. Foliar application of different concentration of micronutrients also improved the morphological characters and seed yield of sesame as N. Interestingly 1000-seed weight did not show any significant differences with both N and micronutrients. The maximum number of pod plant-1, pod diameter, pod length, seed weight plant-1, seed yield (1.14 tha-1) significantly increased with 150 ppm micronutrients. Therefore, this experimental results suggest that the use of 60 kg Nha-1 and 150 ppm micronutrients have produced highest seed yield of sesame by adjusting in plant morphological characters and yield contributing characters of sesame.